Will the song of the sarus be heard when the wetlands of Uttar Pradesh are drained? every once in a while, eating the tuberous growth in the wetlands, the male and female Sarus crane ( Grus antigone antigone ) strike a pose and make their call in unison. The villagers of Etawah and Mainpuri districts of Uttar Pradesh ( up ) have for ages been used to such antics of the bird. But the Sarus could soon become scarce in the two districts that have witnessed some of the biggest congregations of the non-paired-up Sarus in the country, feeding themselves, finding their mates and breeding in the wetlands and the agricultural fields of the two districts. 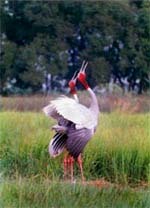 The up state government wants to dispense with the wetlands and its state bird, the Sarus crane, which depends upon these wetlands. The Uttar Pradesh Bhumi Sudhar Nigam ( upbsn or the Land Improvement Corporation) has, under a World Bank-funded project to reclaim sodic land in the two districts, designated the wetlands also as wastelands that are to be reclaimed for agricultural purposes. It's an appalling story of departments within the government at loggerheads with each other, misplaced enthusiasm and a farce perpetrated in the name of the state running a participatory development programme. The victims of this charade could be, besides the besieged Sarus, the villagers of the two districts. Worse still, the people perhaps do not even realise how precariously their future hangs in the balance. Of the several villagers of the region interviewed by Down To Earth none knew what the project was all or whether the land would be transfered to them after reclamation for cultivating. They all believed that the us $194.1 million up government project is specifically to drain the wetlands and not to reclaim the Ussar (saline-alkaline) land, as it is projected on the government and World Bank papers. The Kuddaiya wetlands in Mainpuri district are already being drained and the work is on way at the Ambarpur wetlands in the district. Vidya Ram, resident of Ambarpur, like many others, says wistfully, "The government is draining the wetlands, perhaps for agriculture. I don't know why. Who knows what the government does? Once the wetlands are gone the sarsai ('sarus' in the local dialect) will never be seen here again." Next on the anvil for drainage is the Sarsai Nawar jheel ('the shallow lake where the sarus resides' in the local dialect) in the same district. A single survey done at the site showed up as many as 219 sarus cranes in congregation and 16 breeding pairs. Arvind Kumar, a sub-contractor for the drainage of the Ambarpur wetlands, reveals how fictitious the proclaimed 'participatory approach of the project' is when he proudly claims, "With the Rs 40,000 a day heavy load machine that I have rented I'll drain the area in just 20 days. These local politicians are corrupt and putting up hurdles, they want me to hire villagers as labour. Nothing doing, I say." The future of both, the farmers of the region and the bird is imperilled by the project, which on the face of it is meant to benefit the farmers. Under the project, some 1,800 hectares of land is to be reclaimed for agriculture from Etawah in this year alone. Areas in Bhartana, Bhiduna and Etawah block are earmarked for draining this year. K S Gopisundar, Etawah-based researcher of the Wildlife Institute of India, who is studying sarus ecology, explains the consequences of the drainage, "The sarus population in the region is today dependent upon both the paddy and wheat fields as well as the wetlands for food. The wetlands provide the tubers of Cyprus rotendus in huge quantities and small insects as well as fish for the sarus; their dependence on the paddy and wheat in the fields is limited. Once the waterlogged areas are drained, the sarus will feed entirely on the fields for food. The damage that nearly 2,000 sarus and the rest of the avifauna will wreak on the fields will turn the farmers against the birds. The farmers will suffer and the birds, in all probability will be hounded out of the region. Not known to be migratory by nature, what will happen then is anyone's guess." George Archibald, chairperson of the International Crane foundation, says, "The wetlands work as sponges during flash floods. They absorb water and release it slowly. Once they disappear, the water during heavy monsoons and flooding of the rivers could inundate the villages." Wetlands, besides providing alternative livelihoods, such as fisheries, play a crucial hydrological role -- they recharge groundwater. The two districts therefore are threatened with a form of ecological poverty as well. While the Chief Wildlife Warden of up has recently shot off letters to the state administration asking for the work to stop, the bureaucratic maze through which all such letters of protest have to traverse may ensure that the sarus does not get any help on time. The district administration asks the forest department to put forward a proposal to stop work, the forest department waits for the up government to officially tell them of the status, the World Bank does one better. It refuses to admit that the project could lead to such calamitous consequences. After all, the World Bank needs to defend its earlier claims that the biodiversity in the region is bound to increase after the conversion of the wetlands into agricultural fields. Experts call it hogwash. The world bank has decided to forego any further assessment of the impact on biodiversity till the project is over. In other words, a post mortem is all they wish for the threatened birds. Officials at the World Bank office, at New Delhi, refuse to comment on the project or its consequences and fend it off on the state government and the upbsn . Rajeev Chauhan, secretary general of the Etawah-based non-governmental organisation, Society for Conservation of Nature, laments, "My grandmother recollects seeing the Siberian crane here in the past. I do not want my children to have to look in a bird book to tell what a sarus looks like. For years we have enjoyed the presence of the migratory and dozens of other birds and they too have found a haven here. The sarus' territory is shrinking. I wish the government wakes up to take timely action." Gopisundar says all that the administration needs to do is stop the drainage and nothing more. "People have cohabited with the sarus so far, trust them to do it in the future also. Their symbiotic relation is a sign of ecological security. If the birds fly off to other regions or go extinct, rest assured, the ecological balance too will be lost," he says.